Used for commercial carpet tiles. Sometimes seen at the bottom end of the market, these carpets have no visible backing. The pile is matted/felted rather than tufted, and sticks together firmly. The author has no experience with these. There are 3 ways to identify pile material on an existing carpet. Bleach (somewhere inconspicuous) removes all colour from natural fibres, some colour from most synthetics, and has no effect on bleachable polypropylene. Much used luxury carpet types. These are manufacturing methods, not brand names, so may be made in any location. The most popular carpet type. If one tile gets stained or damaged, it's easily replaced. Sticking down with tackifier makes for quick tile removal any time. Luxury carpet type popular in the 70s. A brand of fully waterproof antimicrobial carpets. Woven piles like Axminster & Wilton are more durable than punched cut pile. Pile length also affects performance, short pile is much more resistant to flattening than long. Large discounts can be had from retailers. Beware of the travelling sellers that show good quality specimens then fit cheaper carpet, claiming it's what you ordered and paid for. Choose clean carpet only. Used carpet can be cleaned, but cleaning may fail to remove all stains, and general dirt can hide stains. Used carpets are available from giveaway schemes such as freecycle and others. New limited size pieces left over from stocked carpets. Often no cheaper than buying the same carpet off the roll. Smaller pieces are available from some carpet suppliers free. If money is tight, using reasonably clean used carpets as underlay can leave enough money for better quality carpet. This has its pros and cons, and is discussed here. It supports the carpet less than underlay, and relatively thin weak carpets can wear faster as a result. These are risk factors rather than anything that's going to happen, and in practice this approach normally works ok. This is one topic that tends to bring up opposing points of view at times, whether stretching is necessary or not. Lots of people lay carpet sucessfully without stretching it. Slight stretch can help avoid risk of ripples occurring later. Mixing downlighting with carpets is a recipe for poor energy efficiency. The darker the carpet, the worse the result. If interior daylight is poor, changing from dark to light carpet can help. Fairly obvious, but it gets overlooked. Hessian backing does not last as well when damp is enountered, but is fine if it stays dry. Synthetic pile & backing is most tolerant of damp. Bathroom carpet is the domestic type closest to car carpets. Its waterproof. The author doesn't know if original vehicle carpets have any fire retardants added to improve safety. If you want bathroom carpet, a carpet cleaner would be a good idea too. Waterproof backing is best for suspended timber floors. A permeable backing is best for historic masonry floors with no dpc, as it permits evaporation from the floor. Brush vigorously until pile stands up. apply latex glue to backing, eg Copydex. PVA also works, but dries semi-rigid, so must be kept to the backing and base of pile only to maintain a soft feel for bare feet. PVA can make the carpet feel stiff at first, but it softens in use. Apply latex to all cut edges to prevent fraying. If you don't want the carpet to stick to the floor or underlay, put a piece of cloth flat under the cutout hole, gluing it in place, and glue the new patch to it. If the paint is water based and still wet, act right away and you should get a perfectly clean result. Half an hour with a cloth & plenty of clean water should see it looking like new. Spots of dried emulsion can be removed with a chisel. With this method its possible to remove lots of paint spots and leave the carpet looking like new. When scraping, it's necessary to rotate the direction of scraping round so the carpet is scraped from all angles. Scraping over it in one or 2 directions isn't effective. What does in all directions mean? If you were to move yourself around the paint spot while you scraped, always scraping toward yourself, that would do it. Occasionally the scraping approach fails to break up hard lumps. If so, whack down on the lumps with the chisel for a bit until they break up. The plan is to slowly break them up, not to apply enough force to cut anything. Rugs & mats on smooth surfaces tend to slip easily, risking injury. Rubber backing solves this. To use an existing slippery rug, rubberised string mesh can be sewn onto the back, or a thin smear of silicone sealant applied all over the back. Clear is invisible if a tiny bit gets somewhere visible. Mats that curl up at the edges are a trip hazard. Sometimes they can be fixed by weighting them down for a while, sometimes not. Thick rubber backing behaves well. Peelable double sided tape is an option for badly behaved mats on hard floors. Carpet is made into rugs & mats by 'whipping' the edges. This is a 2 step oversewing process. First white thread widely spaced is used to consolidate the edge, then carpet coloured thread is oversewn closely to give a good finish and further robustness. 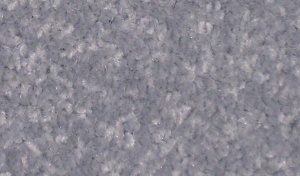 Carpet offcuts are sometimes turned into rugs economically. Mats sat on carpet tend to walk in the direction of the carpet's pile. Sewing it in place with half a dozen stitches to the carpet's backing using a mattress needle (a curved needle) is an option. This page was last modified on 5 April 2018, at 02:23. This page has been accessed 103,931 times.